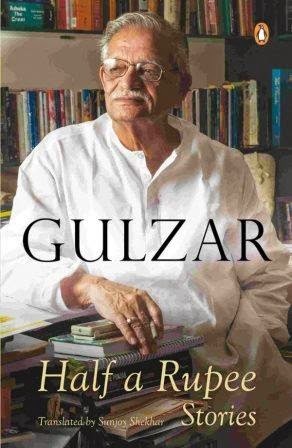 Twenty-five fascinating stories from the inimitable Gulzar. A suicide bomber in a small town plans out her last day, getting herself photographed before she goes and blows up the prime minister. A drunkard in a Mumbai slum tries to compete with the torrential rain, even as it washes his dwelling away. An army man at the border has become so accustomed to speaking over the wireless that he ends every sentence with ‘Over!’ And in the title story, a cop drags a dead cow from Vinayak Rao Patwardhan Road to the adjoining Bapu Road, since the latter is so much easier to spell. From real-life stories about Javed Akhtar, Sahir Ludhianvi and Kuldip Nayyar to tales set in Kashmir, in the hinterland, in the modern megapolis and on the LoC, from anecdotes of love and betrayal to fables of courage and conviction, this is an enthralling collection available in English for the very first time. The anthology contains twenty five short stories which are grouped into eight sections, with each part comprising three to four stories. The batching of stories into eight different eight part has been done intentionally as each of the section adheres to a typical facets of life whose contours the stories in it try to surmise. The first section relates to memoirs of the author wherein he goes back in his life and recalls some of the people and the incidents that managed to touch the chord with him. As the preface of the same reads, “Walk through the pages of a book and You will find the characters like old friends in the corridors of time.” In first story, he traces his journey to Wagah border along-with veteran journalist Kuldip Nayar where the later shares with him about his mystic relationship with Pir Baba. The second story poignantly discovers relationship of Javed Akhtar and Sahir Ludhianvi (both noted poet). And the third story again traces the anecdote of Gulzar’s trip with Bhushan Banmali (noted write) in the Himalayas. The preface of the second section reads, “Feet on the ground, water over your head – This is the megalopolis of Mumbai.” As evident from the introductory statement above, this section deals with Mumbai and the emotions of the people dwelling in the city. The first story explores the plight of the slum dwellers who have moved to one room apartments; though they can boast of having pukka house now, life seem to have lost its way somewhere in the pretext of restricting the odor of the poverty to that box shaped house. The second story tries to showcase the impact of relentless rain on the slum dwellers of Mumbai. The third story, is a tender account of the life of a sweeper whose life appears futile during the daytime doing menial jobs but assumes significant grandeur at night when at home he finds himself as the captain of his family driving the lives of so many lives. The final story of the section explores the life on the footpath of by-lanes in Mumbai which house innumerable souls in its womb who carries more than innumerable dreams in them. The third section of the book deals with the stories and anecdotes across territorial borders – Dreams heed on borders, the eyes need no visas…with the eyes shut I walk across the line in time – All the time. The first story in the section deals with the dilemma of the Indian Army Major who discovers that Commander in Chief on the other side of the border is his childhood friend who got separated amidst the backdrop of partition. The second story is an extract of Gulzar’s own experience with his friend Gopi during their visit to an outpost in Rajasthan when the later unknowingly crosses the border and is helped by a fugitive from the other side of the border. The third and final story of the section narrates another experience of the author shared by an ex-army caption from Pakistan about a boy found in one of the desolated house. The fourth section enumerates stories woven in the back drop of human disasters, “A Region of heads, a throng of limbs…Abandoned apparatus from a defunct factory…spare parts all.” The starting story tells a simple incident of making fish in one of the Bengal household when the whole Bengal is burning in riots. The second story talks about the growing up of an infant in the backdrop of bombings in Afghanistan. And the final one beautifully depicts the emotions of a journalist’s visit to her birth place Kashmir which is reeling under disturbance and rift amongst Indian Army & locals. It never shows in the face and never stops blubbering . . . A thought like a cricket, in the dreary silence of my soul. Keep Chirping – the fifth section kicks off with the story about a guy and his tryst with his namesake who happens to be a wanted naxalite. The second story deals with thoughts of a suicide bomber few hours before she is to bomb PM. The final story (which also happens to be the titular one) talks about a common man’s life in Mumbai juggling in the hands of politicians and goons. The sixth section contains the innocent tales about the children and their thought process in those tender years. The preface speaks thus, “Growing up I was stuck by a thought . . . shouldn’t I ask around how important is it . . . To grow up.” The stories range from a nine year old’s passion and craze for superman considering him as a God to a boy’s (down with fever) urge to eat the orange he possesses. The other story in the collection is about a male sparrow and his love for a kite which he perceives as some lady bird. The seventh section starts with an introduction, “I run and I run to keep in step…But look at this life…How quickly it marches on.” It contains stories of a person stuck under the earth for 18 days due to earthquake, an anecdote of author’s sojourn in Himalayas when he took a shortcut amidst the mountains to reach some locations and the plight of a person rushing to hospital to meet his wife due for delivery only to find that he has been pickpocketed. The eighth and final section of the book deals with the stories relating to old age souls and their feelings– A diamond may be cut by petal of the flowers…But even a chainsaw fails to cut through…the ties that umbilical cord binds. The first story talks about the love between an elderly couple and the impact on one’s heart when the other does something without his concurrence and knowledge. The second story is a profound tale of grandfather’s love for his grandchildren. And the final story of the book about an old man who misses his wife badly after her death and creates a personality of her inside himself. One of the most enticing features of Gulzar’s creation is their closeness to the ‘realism’. He has that prodigious caliber to pick up the threads from the daily lives and weave out the magical piece in a manner that strikes a chord with the reader of almost every genre. There are no thick plot’s per se, no over the top twists and turns, no larger than life characters or backdrops but just simple stream of characters who has the tendency to take a piece of you along-with when they traverse through the story. As mentioned above, the entire twenty five stories in the book have been divided into eight parts, each dealing with one distinct aspect of human life. Each of the story and anecdote mentioned herein is poignant, tender and soul stirring compelling the reader to stop and think over, after each story is completed. While very few of the stories does appear to slightly lack the steam of Gulzar’s work (I am not sure whether that is due to the translation or otherwise), most of the piece of writing aptly captures the essence of human behavior. Stories like ‘Sahir and Jaddu (discovering the relationship noted poets of Javed Akhtar and Sahir Ludhianvi), The Stench (exploring the plight of the slum dwellers who have moved to one room apartments), The Charioteer (one of the best stories in the book about the life of mehtar), The Search (beautifully depicts the emotions of a journalist’s visit to her birth place Kashmir), Ghughu and Jamuni (another gem of the book, a poignant story about male sparrow and his love for a kite which he perceives as some lady bird) among many others captures reader’s heart and emotion as one reads them. Some of these are so tender and touching that I actually stopped after reading them just to ponder over the brilliant mark those have left on my heart – something which only a magician like Gulzar can do. There is some inherent symphony in his work that one can never ever escape to be amazed by the aura of his work which simple yet profound. The cover page of the book boasts of a graceful and royal pic of Gulzar – a sufficient reason for his fan to be lured enough and buy the book. The printing, font and word spacing are decent enough to grant reader a comfortable read. Half a rupee stories by Gulzar is a compendium of twenty five stories touching various chords of the human sentiments, woven around those daily emotions of one’s life that there is some inherent oneness that the reader feel once he reads the stories. There are no major plots in the stories to glue the readers…there are no exemplary twists and turns to arouse one’s interest…there are no larger than life characters that remains historic… There is, however, an experience of almost each and every shade of life which makes these enriching and engrossing. Pick this masterpiece to read leisurely to enjoy it the most, don’t rush upon the stories…read each one of them slowly enjoying the flavor and the intensity. There are some stories which will make you smile, there are some which will make you gush, there are some which will make you heavy and there are some which will make you ponder. There is everything for everyone in this book. Do grab a copy and find yourself submersed in the magic of Gulzar…once again. 1. When you face your fear, you become familiar with it and familiarity makes it lose its meaning, loosen its grip—fear ceases to be fear. 2. Because common man like us only having half of the things – half plate eating, half night sleeping, half laughing, half crying, half living and also half dying. This atthanni never becomes a full rupiah. 3. …and if I go visit Pakistan for a little while, what harm will I cause to that country, what will I have pillaged? Not that there is a dearth of pillagers and plunderers in that country or ours. No one needs to raid our countries from outside. 4. Now Maruti wasn’t the lowliest of the low, not a mere mehtar; he was the captain of his family: the charioteer steering a seven-horse chariot. 5. Between the two milestones, the land lies barren – just a patchy growth of puny scrub which sheep and camels keep scratching at. These animals roam about with full freedom on the either side of the border, unburdened by religion, unfettered by boundaries of nation states.